Well, the lights work. So far, so good. The Lockheed Martin team developing the U.S. Air Force’s next-generation GPS III satellites has turned on power to the system module of the program’s first spacecraft, designated GPS III Space Vehicle One (SV-1). According to the prime contractor, the achievement is a key indication that the team is on track to deliver the first satellite for launch availability next year, although the actual first launch will probably take place in 2015. “This milestone is the latest in a series of critical events signifying that our joint government and industry GPS III team is performing efficiently and meeting its commitments,” said Lt. Col. Todd Caldwell, the U.S. Air Force’s GPS III program manager. Successfully powering on GPS III SV-1 demonstrates mechanical integration, validates the satellite’s interfaces, and sets the stage for electrical and integrated hardware-software testing. The satellite will complete its assembly, integration and test (AI&T) in Lockheed Martin’s GPS Processing Facility (GPF) at its Waterton site near Denver, Colorado. As with aircraft or automobile manufacturing, each GPS III satellite will move through sequential work stations for various AI&T operations, culminating with shipment to the launch site. Lockheed Martin is currently under contract for production of the first four GPS III satellites, and earlier this month, the U.S. Air Force awarded Lockheed Martin two fixed-price contracts totaling $120 million to procure long-lead parts for the fifth, sixth, seventh and eighth GPS III space vehicles (SVs). 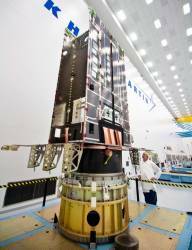 The Air Force plans to purchase up to 32 GPS III satellites. The GPS III team is led by the Global Positioning Systems Directorate at the U.S. Air Force Space and Missile Systems Center, Los Angeles Air Force Base, California. Lockheed Martin is the GPS III prime contractor with teammates ITT Exelis, General Dynamics, Infinity Systems Engineering, Honeywell, ATK, and other subcontractors. Air Force Space Command’s 2nd Space Operations Squadron (2SOPS), based at Schriever Air Force Base, Colorado, manages and operates the GPS constellation for both civil and military users.